Dream Deferred | Hungary’s racist referendum result – what does it mean? Yesterday the response was both horrific and contradictory. Over 98% of those who voted were against accepting EU migrant quotas. But that shocking vote should be tempered with the news that only 43% of the electorate voted. This means that the ballot is technically invalid because voter turnout failed to exceed the 50-percent-plus-one vote threshold. This is a set back for prime minister Viktor Orban and his authoritarian far right racist populist party Fidesz. While the referendum has no binding legal consequences for the EU, Orban hoped its passage would increase pressure on the EU to act against migrants and encourage other European states to hold anti-migrant referendums. On the domestic front he hoped it would undermine Jobbik, his fascist rivals. The main social democratic parties, trade unions and civil rights are rightly buoyed by the result. Many called on voters to boycott the referendum and others urged casting invalid ballots that would not count in the final tally, but would still could be seen as a rejection of the government’s anti migrant policies. The 2 October referendum is important, first of all, because of the campaign that preceded it: such a gigantic wave of racist state propaganda has never been seen in Europe since the end of the Second World War. It is everywhere: from giant billboards to new elementary school textbooks, from the internet to hundreds of thousands of personal phone calls civil servants were forced to make to mobilise for the ‘NO’ vote. The Hungarian government sent 4.1 million, full-colour, 20 page booklets to Hungarians at home and abroad making the government’s case for why Hungarians should vote “NO”. Illegal immigrants don’t respect our laws, and they don’t want to share in our common cultural values. If we don’t take action, in a couple of decades we won’t recognize Europe… Illegal immigrants do not respect European norms, among others the rights of women. Since the immigrant crisis began the number of assaults on women have grown by leaps and bounds. We lose our European values and identity the way frogs are cooked in slowly-heating water. Quite simply, slowly there will be more and more Muslims and we will no longer recognize Europe. According to the NGO atlatszo.hu the Hungarian government spent €48.6 million on this hate-filled campaign in a country of just 9.9 million inhabitants. To put this into some perspective for a UK audience, it was more than the combined amount spent by both sides in the Brexit referendum campaign. Orban has suffered a setback; the referendum did not deliver the clear mandate he wanted. But as he made clear in his TV speech on Sunday night, he will ignore electoral niceties, he believes he has a big enough mandate and will continue to push his anti migrant message both at home and in the EU. You can’t measure the result just in terms of the weight of votes. 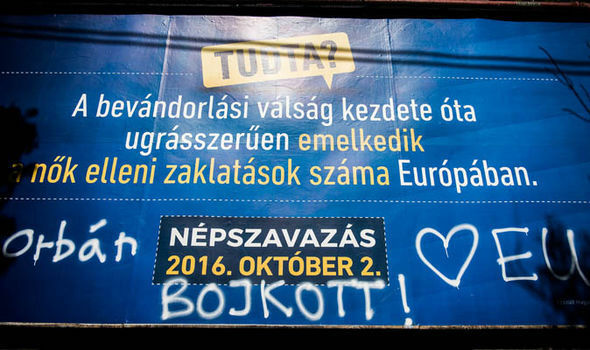 Racism in Hungary has grown during this referendum campaign to even more frightening levels. A year ago, at the height of the refugee crisis 55% of Hungarians said the government needed to do more for refugees, the latest polls show that has fallen to just 15%. Roma rights groups report a huge spike in physical and verbal attacks. And those migrants who want to travel through Hungary to find better lives for themselves and their families know the Hungarian state will be given even more powers to physically beat them back. Just as night follows day, Orban will want to ratchet up his war against migrants. The fact that over 50% of the Hungarian electorate did not endorse him shows that he can be opposed.